Thinking for Clinicians provides analysts of all orientations with the tools and context for working critically within psychoanalytic theory and practice. It does this through detailed chapters on some of the philosophers whose work is especially relevant for contemporary theory and clinical writing: Emmanuel Levinas, Martin Buber, Ludwig Wittgenstein, Maurice Merleau-Ponty, and Hans-Georg Gadamer. Orange presents the historical background for their ideas, along with clinical vignettes to help contextualize their theories, further grounding them in real-world experience. 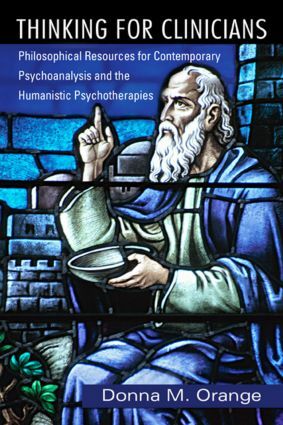 With a hermeneutic sensibility firmly in mind, Thinking for Clinicians rewards as it challenges and will be a valuable reference for clinicians who seek a better understanding of the philosophical bases of contemporary psychoanalytic theory.